National PTA launched its College and Career Readiness (CCR) initiative in 2009. Since that time, PTAs (states, districts, councils, and local units) that lie within the selected states have taken significant action to drive the College and Career Ready movement forward in their state and receive significant support from National PTA in order to do so successfully. The resources made available to states participating in the initiative provide a marked opportunity for: improving child advocacy capabilities, enhancing the ability to mobilize members, increasing the PTA’s stature as a critical education player, and improving educational opportunities for children. NEW! CCR Parent Education Tool Kit - Everything you need to host a training on College and Career Readiness at your school! PTAs in selected states partner closely with National PTA to benefit the children of their state by building their advocacy capacity and strengthening the efforts of their outreach. 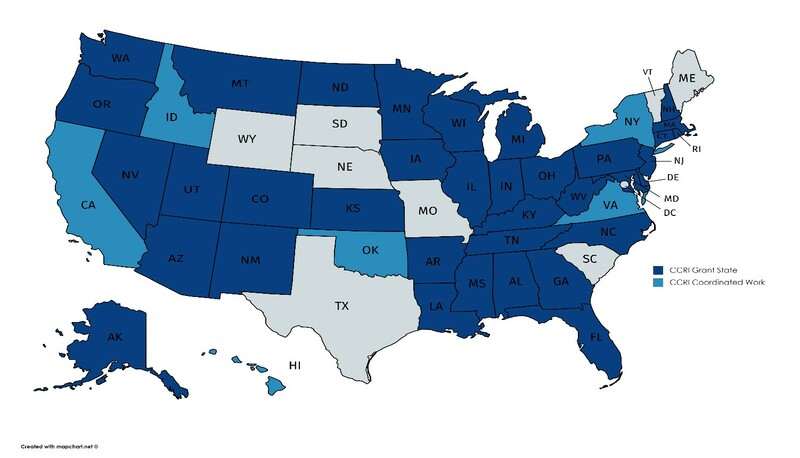 National PTA currently has six states working on intensive campaigns focused on advocacy and issue education related to college and career readiness including: standards, assessments, implementation and accountability. Arkansas PTA: AR PTA CCRI Committee includes: State Lead: Trina Kuklaw, State President: Shelly Anderson, Committee Members: Kelli Gill and Amberly Knowlton Hayes. Georgia PTA: GA PTA CCRI Committee includes: State Leads: Tynettia Elrod and Lisa-Marie Haygood, State President: Tyler Barr, Committee Members: Kristy Flowers, Shanda Ross, Daniel White. Michigan PTA: MI PTA CCRI Committee includes: State Lead: Joyce Heideman, State President: Sibyl Collins Wilson, Committee Members: Shaton Berry, and Teresa Marhofer. New Jersey PTA: NJ PTA CCRI Committee includes: State Lead: Natalia Suarez, State President: Rose Acerra, Committee Members: Rob Acerra, Elise An, Lynette Howard, Cathy Lindenbaum, and Sharon Roseboro. West Virginia PTA: WV PTA CCRI Committee includes State Lead: Janelle Sperry, State President: Kathy Parker, Committee Members: Rose Rossana, and Karen Sherman. Wisconsin PTA: WI PTA CCRI Committee includes State Lead: Angie Mattes, State President: Angie Mattes, Committee Members: Robin Anderson, Michael Anton, Cyndi Barbian, Ellen Chicka, Andi Krizan, Heidi Nicolazzo, and Brenda Ward.